Ok, I couldnt paste or do anything in my link - my video was 80MB so not allowed. I didnt have a plugin, but was using current chrome - is that supported? First, go to YouTube, Video, or Wistia, and upload your video there. 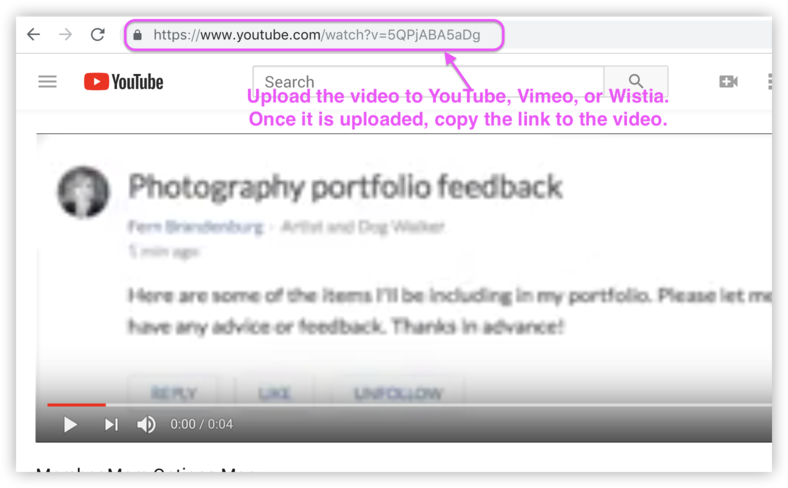 Paste the link into the 'Add Video' popup and click OK. I hope this helps! Let me know if I can clarify anything. Thank you! Hi sue , if the area wasn't clickable this may be due browser plugin conflict. In your screenshot, it shows that you have the Grammarly plugin installed. Try opening a new browser incognito window (File menu > New Incognito Window) and repeating the steps to paste a link in the field. Running 'incognito' disables browser plugins. Let me know if that helps. Thank you!